RENO, Nev. (AP) — Despite overall numbers in the tens of thousands, mustang advocates say the wild horse is on the verge of going extinct in North America for the second time in 13,000 years and deserves protection under the Endangered Species Act alongside grizzly bears, the desert tortoise and humpback whales. Efforts to halt mustang roundups in Congress and the courts have been unsuccessful over the past decade, but two groups in a petition to the U.S. 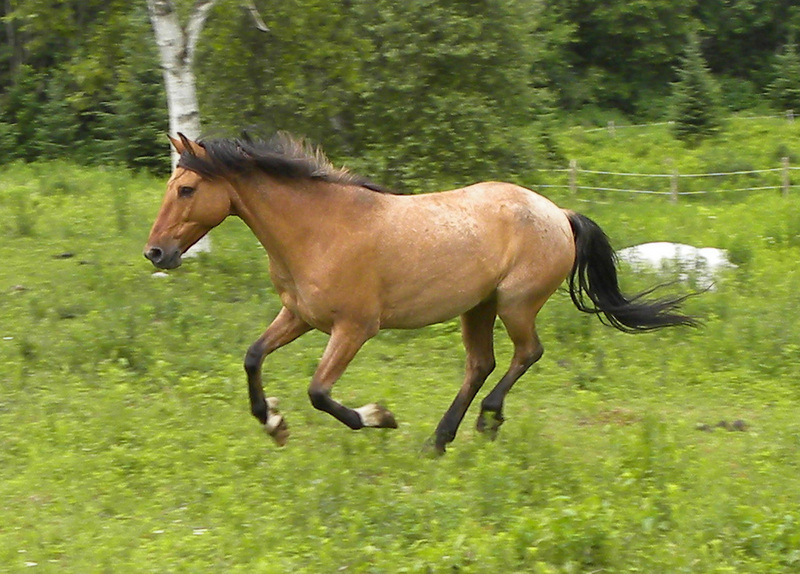 Fish and Wildlife service are focusing on genetics and research they say prove the horses are a native species. They say growing threats from development, livestock grazing and government gathers are jeopardizing the genetic viability of individual herds in 10 states from California to Montana. The petition states mustang habitat has shrunk 40 percent since President Richard Nixon signed the Free Roaming Wild Horse and Burro Act into law in 1971. It advances an argument that the Bureau of Land Management long has rejected — that the wild horse is a native species that only temporarily went extinct on the continent 11,000 to 13,000 years ago before Spanish conquistadors reintroduced it to North America in the 1500s. 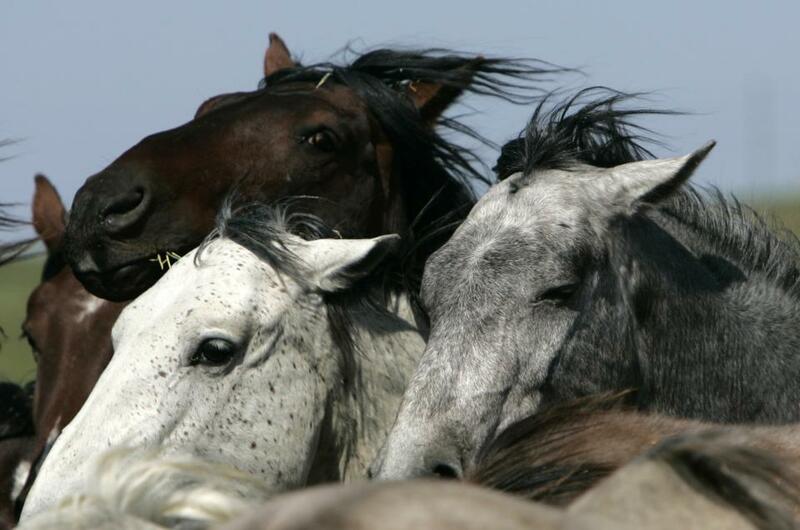 The call for protection comes as BLM insists the public rangeland — much of it in the throes of drought — is being degraded by an overpopulation of nearly 50,000 horses and burros, about half of them in Nevada. The petition accuses the agency of undermining U.S. law protecting mustangs by abusing its authority to order roundups based on a determination that the herds are in “excess” to further the agency’s interest in minimizing competition with wildlife, cattle and sheep. While BLM estimates 49,208 horses and burros are on the range, the petition says none of the isolated herds number anywhere near the 2,500 most biologists consider necessary to keep a distinct species viable. About three-fourths have fewer than 150 horses, it said. Harris, legal director of the wildlife program at Friends of Animals, admits it may be tough to sell the public on the idea the mustangs are endangered given there are thousands in Nevada alone. “But I don’t think it will be a hard sell at all to the biologists at the Fish and Wildlife Service who examine the question of genetic viability over and over when it comes to endangered species,” he told The Associated Press on Friday. 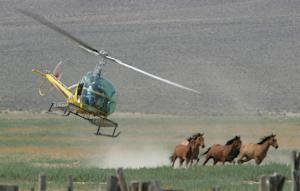 www.sorraiamustangs.netThe Nevada Cattlemen’s Association and the Public Lands Council are among those arguing the petition is invalid because the horses aren’t native to North America. They say protection afforded mustangs under the Wild Horse and Burro Act is undercut by BLM’s failure to keep herd sizes in check. The petition filed June 11 points to recent research concluding that the modern horse — genus Equus — originated in North America 3 million to 4 million years ago, spread to Eurasia by crossing the Bering land bridge 2 to 3 million years ago and became extinct in North America no longer than 13,000 years ago. It cites the work of Jay F. Kirkpatrick, a leader in horse reproduction research who directs ZooMontana’s Science and Conservation Center in Billings, Montana. Can Gliese 832c support life, or is it just a super-Venus? Sci-News.com is reporting that astronomers at the University of New South Wales have discovered an Earth-like planet just 16 light-years away. The planet, dubbed Gliese 832c, is orbiting a red dwarf star half the mass and radius of our own sun. Gliese 832c has an orbital period of about 35 days, and a mass more than five times that of Earth’s. More importantly, however, Gliese 832c is orbiting within the habitable zone of the red dwarf, and receives the same average stellar energy as Earth does from the Sun, Sci-News.comreports. Gliese 832c’s mass means it likely has a far denser atmosphere than Earth does, which could make the planet’s weather hot and volatile. If this is the case, the planet might be more like a super-Venus than a super-Earth. “If the planet has a similar atmosphere to Earth it may be possible for life to survive, although seasonal shifts would be extreme,” the University of South Wales’ Professor Chris Tinney said. 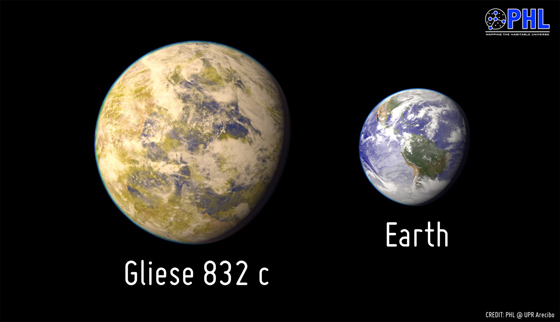 Even so, Gliese 832c is one of the most Earth-like planets we’ve ever encountered. “[Gliese 832c is] one of the top three most Earth-like planets according to the [Earth Similarity Index] (i.e., with respect to Earth’s stellar flux and mass) and the closest one to Earth of all three — a prime object for follow-up observations,” writes Abel Mendez Torres on the Planetary Habitability Lab’s blog. “It’s just a stone’s throw from Earth in the cosmic scheme of things,” adds Space.com’s Mike Wall. Washington (AFP) – NASA sent a saucer-like vehicle high into the sky to test technology for a future Mars landing, but its parachute tangled when deployed and the spacecraft splashed into the Pacific Ocean. The test began when the US space agency attached its “Low-Density Supersonic Decelerator” vehicle to a helium balloon the size of a football field, the largest ever deployed, at a military base on the Hawaiian island of Kauai. The balloon carried the saucer high into the sky starting at 1840 GMT. NASA television broadcast the event live. After some 2.5 hours of ascent, when the balloon reached a height of 120,000 feet (36,600 meters), it detached the saucer, which fired its rocket engine and rose to 180,000 feet (54,900 meters) traveling at 3.8 times the speed of sound. This successfully slowed the saucer’s descent to 2.5 times the speed of sound. As the saucer plunged towards Earth, NASA began its second test — deploying a giant parachute 36 meters in diameter. The new technologies are being tested at extremely high altitudes similar to those in Mars’ upper atmosphere. To land on Mars NASA has been using a parachute system first used in the 1970s, but with heavier spacecraft larger parachutes are needed. 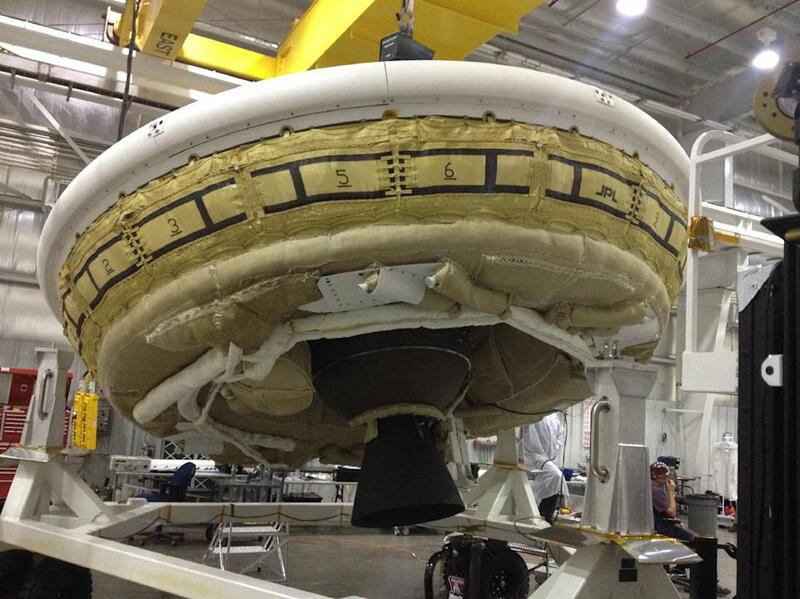 The mammoth parachute should have helped the saucer complete a gentle landing on the Pacific Ocean. Instead it failed to fully deploy and the saucer plunged into the water. Despite the parachute failure, NASA was satisfied with the $150 million test. “What we saw is a very good test,” said Coatta, noting that everything went well up to the point of the parachute test. “This is an opportunity to look at the data and learn what happen and apply that for the next test,” he said. NASA has two more flights planned to further test the new landing technology. Strong winds had forced NASA to postpone the flight, originally scheduled for a two-week launch window in early June. View full size image Physical science, which includes chemistry and physics, is usually thought of as the study of the nature and properties of matter and energy in non-living systems. Matter is the “stuff” of the universe — the atoms, molecules and ions that make up all physical substances. Matter is anything that has mass and takes up space. Energy is the capacity to cause change. Energy cannot be created or destroyed; it can only be conserved and converted from one form to another. “Potential energy” is the energy stored in an object due to its position — for example, a bucket of water balanced over a doorway has the potential to fall. “Kinetic energy” is energy that is in motion and causing changes. Any object or particle that is in motion has kinetic energy based on its mass and speed. Kinetic energy can be converted into other forms of energy, such as electrical energy and thermal energy. There are five known phases, or states, of matter: solids, liquids, gases, plasma and Bose-Einstein condensates. The main difference in the structures of each state is in the densities of the particles. SolidsIn a solid, particles are packed tightly together so they are unable to move about very much. Particles of a solid have very low kinetic energy. The electrons of each atom are in motion, so the atoms have a small vibration, but they are fixed in their position. Solids have a definite shape. They do not conform to the shape of the container in which they are placed. They also have a definite volume. The particles of a solid are already so tightly packed together that increasing pressure will not compress the solid to a smaller volume. Liquids In the liquid phase, the particles of a substance have more kinetic energy than those in a solid. The liquid particles are not held in a regular arrangement, but are still very close to each other so liquids have a definite volume. Liquids, like solids, cannot be compressed. Particles of a liquid have just enough room to flow around each other, so liquids have an indefinite shape. A liquid will change shape to conform to its container. Force is spread evenly throughout the liquid, so when an object is placed in a liquid, the liquid particles are displaced by the object. The magnitude of the upward buoyant force is equal to the weight of the fluid displaced by the object. When the buoyant force is equal to the force of gravity pulling down on the object’s mass, the object will float. This principle of buoyancy was discovered by the Greek mathematician Archimedes who, according to legend, sprang from his bath and ran naked through the streets shouting “Eureka!” Particles of a liquid tend to be held by weak intermolecular attraction rather than moving freely as the particles of a gas will. This cohesive force pulls the particles together to form drops or streams. Gases Gas particles have a great deal of space between them and have high kinetic energy. If unconfined, the particles of a gas will spread out indefinitely; if confined, the gas will expand to fill its container. When a gas is put under pressure by reducing the volume of the container, the space between particles is reduced, and the pressure exerted by their collisions increases. If the volume of the container is held constant, but the temperature of the gas increases, then the pressure will also increase. Gas particles have enough kinetic energy to overcome intermolecular forces that hold solids and liquids together, thus a gas has no definite volume and no definite shape. Plasma Plasma is not a common state of matter here on Earth, but may be the most common state of matter in the universe. Plasma consists of highly charged particles with extremely high kinetic energy. The noble gases (helium, neon, argon, krypton, xenon and radon) are often used to make glowing signs by using electricity to ionize them to the plasma state. Stars are essentially superheated balls of plasma. Bose-Einstein condensates In 1995, technology enabled scientists to create a new state of matter, the Bose-Einstein condensate (BEC). Using a combination of lasers and magnets, Eric Cornell and Carl Weiman cooled a sample of rubidium to within a few degrees of absolute zero. At this extremely low temperature, molecular motion comes very close to stopping altogether. Since there is almost no kinetic energy being transferred from one atom to another, the atoms begin to clump together. There are no longer thousands of separate atoms, just one “super atom.” A BEC is used to study quantum mechanics on a macroscopic level. Light appears to slow down as it passes through a BEC, allowing study of the particle/wave paradox. A BEC also has many of the properties of a superfluid — flowing without friction. BECs are also used to simulate conditions that might apply in black holes. Adding energy to matter causes a physical change — matter moves from one state to another. For example, adding thermal energy — heat — to liquid water causes it to become steam or vapor — a gas. Taking away energy also causes physical change, such as when liquid water becomes ice — a solid — when heat is removed. Physical change also can be caused by motion and pressure. Melting and freezing When heat is applied to a solid, its particles begin to vibrate faster and tend to move farther apart. When the substance, at standard pressure, reaches a certain point — called the melting point — the solid will begin to turn into a liquid. The melting point of a pure substance can often be determined to within 0.1 degrees C, the point at which the solid and liquid phases are in equilibrium. If you continue to apply heat to the sample, the temperature will not rise above the melting point until the entire sample has been liquefied. The heat energy is being used to convert the solid into the liquid form. Once the entire sample has become a liquid the temperature will begin to rise again. Compounds that are otherwise very similar can have different melting points, so melting point can be a useful way to distinguish among them. For example, sucrose has a melting point of 367 F (186.1 C) while the melting point of glucose is 294.8 F (146 C). A solid mixture, such as a metal alloy, can often be separated into its constituent parts by heating the mixture and extracting the liquids as they reach their different melting points. The freezing point is the temperature at which a liquid substance is cooled enough to form a solid. As the liquid is cooled, particle motion slows. In many substances, the particles align in precise, geometric patterns to form crystalline solids. Most liquids contract as they freeze. One of the important characteristics of water is that it expands when it freezes, so ice floats. If ice didn’t float, there would be no liquid water underneath a frozen body of water and many forms of aquatic life would be impossible. The freezing point is often nearly the same temperature as the melting point, but is not considered to be characteristic of a substance, as several factors can alter it. For example, adding dissolved substances, or solutes, to a liquid will depress the freezing point. An example of this is using salt slurry to lower the temperature at which water freezes on our roads. Other liquids can be cooled to temperatures well below their melting point before they begin to solidify. Such liquids are said to be “super cooled” and often require the presence of a dust particle or “seed crystal” to start the process of crystallization. Sublimation When a solid is converted directly into a gas without going through a liquid phase, the process is known as sublimation. Sublimation occurs when kinetic energy of the particles is greater than atmospheric pressure surrounding the sample. This may occur when the temperature of the sample is rapidly increased beyond the boiling point (flash vaporization). More commonly, a substance can be “freeze dried” by cooling it under vacuum conditions so that the water in the substance undergoes sublimation and is removed from the sample. A few volatile substances will undergo sublimation at normal temperature and pressure. The best known of these substances is CO2or “dry ice.”Vaporization Vaporization is the conversion of a liquid to a gas. Vaporization can occur through either evaporation or boiling. Because the particles of a liquid are in constant motion they frequently collide with each other, transferring energy when they do so. This energy transference has little net effect beneath the surface, but when enough energy is transferred to a particle near the surface; it may gain enough energy to be knocked completely away from the sample as a free gas particle. This process is called evaporation and it continues as long as liquid remains. It is interesting to note that a liquid cools as it evaporates. The energy transferred to surface molecules, which causes their escape, is carried away from the remaining liquid sample. When enough heat is added to a liquid that vapor bubbles form below the surface of the liquid, we say that the liquid is boiling. The temperature at which a liquid boils is variable. Boiling point is dependent upon the pressure the substance is under. A liquid under higher pressure will require more heat before vapor bubbles can form within it. At high altitudes, there is less atmospheric pressure pressing down on the liquid, so it will boil at a lower temperature. The same amount of liquid at sea level is under a greater atmospheric pressure and will boil at a higher temperature. Condensation and depositionCondensation is when a gas transforms into a liquid. Condensation occurs when a gas has been cooled or compressed to the point where kinetic energy of the particles can no longer overcome the intermolecular forces. An initial cluster of particles initiates the process which tends to further cool the gas so that condensation continues. When the gas transforms directly into a solid, without going through the liquid phase, it is called deposition or desublimation. An example of this occurs when subfreezing temperatures convert water vapor in the atmosphere into frost or ice. Frost tends to outline solid blades of grass and twigs because the air touching these solids cools faster than air that is not touching a solid surface. View full size image New York state is set to legalize medical marijuana today, with Gov. Andrew Cuomo expected to sign a bill passed by the state’s legislature last week. But the proposed law is unique, and smoking a joint even for medical reasons will remain illegal.Under the law, doctors can prescribe marijuana compounds for people who have just a handful of life-threatening and serious conditions, such as cancer and epilepsy. The new law also bars smoking the marijuana flower, and instead limits people to either taking pills, consuming the plant’s oils or extracts, or “vaporizing” the drug.Experts say that vaporizing cannabis is probably healthier and less irritating to the lungs than smoking it, but this misty consumption method may also be more potent than smoking. And researchers know far less about the long-term effects of “vaping” the compounds in marijuana extracts or oils, compared with the effects of inhaling compounds directly from the plant, experts say.”We don’t have the same safety data for extracts as we do for the flower,” the part of the plant most often burned when smoking marijuana, said Mitch Earleywine, a psychologist at the University at Albany in New York, who studies marijuana use. It’s not exactly news that smoking marijuana can harm the lungs. Burning marijuana produces hundreds of cancer-causing compounds. The law’s restriction of marijuana consumption to vaping is sensible from a health perspective, Malouff said. “If you’re going to approve marijuana for medical use, why would you have people smoke? There’s no medicine that people smoke,” Malouff said. Several studies suggest that vaporizing is better for health than smoked marijuana. Malouff has found that chronic marijuana users cite reduced lung irritation, as well as improved taste and the absence of a lingering marijuana smell on their clothes and bodies, as key reasons for vaping rather than smoking the plant. A 2004 study in the Journal of Cannabis Therapeutics found that vaporized marijuana contained little other than cannabinoids, and a 2007 study found users inhaled fewer toxic compounds and carbon monoxide when vaping compared with smoking marijuana. And in 2010, Earleywine and his colleague Nicholas Van Dam found that marijuana users who complain of respiratory irritation reported a stark improvement in their symptoms just a month after switching to vaporized forms of marijuana. Those symptoms include asthma, shortness of breath and coughing up phlegm. The researchers also measured objective improvement in the participants’ lung function. But although vaporizing may sidestep respiratory problems, its physiological effects could be slightly different than those of smoked marijuana. That’s especially true for vaporized extracts, which contain little other than cannabinoids such as THC, the main psychoactive compound in marijuana. In Malouff’s study, many users reported that vaporized marijuana felt more potent. By not allowing the smoking of marijuana, lawmakers may have aimed to avoid undercutting the state’s anti-smoking campaigns or to allow police to distinguish legal medical marijuana consumers from illegal pot growers, Earleywine said. But the law could have unintended consequences, as much less is known about the physiology of vaporizing dabs, he said. In a forthcoming study in the journal Addictive Behaviors, Earleywine and his University at Albany colleague Mallory Loflin have found that compared to marijuana smokers, dab users may more rapidly develop tolerance to the active compounds, and may also have a greater risk ofmarijuana withdrawal. In 1963, Herbert A. Gilbert invented a “smokeless nontobacco cigarette,” but it was never commercialized. “Vaping,” or smoking electronic cigarettes, first became widely popular in China, where 60 percent of men are smokers. Modern e-cigarettes were patented in 2003 by Chinese inventor Hon Lik. E-cigarettes feature a replaceable inhaler cartridge containing vegetable glycerin and/or polyethylene glycol, flavoring and nicotine. With every inhalation, a sensor triggers a vaporizer to heat a small amount of liquid flavoring. The liquid turns to vapor and is drawn into the user’s mouth. Vaping is not the same as smoking a water-pipe, or hookah. In a hookah, a burned mixture of tobacco and molasses is drawn through water to cool the smoke. Burning creates cancer-causing chemicals that are inhaled by the smoker. The vaping technology of e-cigarettes does not burn anything; the liquid mixture is simply vaporized. The vapor does not contain the harmful compounds found in smoke from hookahs or cigarettes. The so-called “hookah pen” works like an e-cigarette. The pen vaporizes a liquid and does not involve burning. In theory, since vaping does not burn tobacco, it should be safer than conventional cigarette smoking. A main ingredient in the liquid cartridges, polyethylene glycol, is FDA-approved and is used in many consumer products. A 2013 study in the journal Tobacco Control found that the harmful chemicals in e-cigarettes occurred at levels 9 to 450 times lower than in regular cigarette smoke. By Bahar Gholipour, Staff Writer | June 26, 2014 02:32pm ET Actress Sarah Paulson in the television show “American Horror Story,” wearing especially designed contact lenses. View full size imageThe gruesome eye injuries depicted on the TV show “American Horror Story” are being used to warn consumers about the dangers of wearing decorative contact lenses, the U.S. Food and Drug Administration (FDA) announced today (June 26). Decorative contact lenses can cause eye injuries, including tears on the eye’s surface, which may lead to infection, serious eye damage and even blindness. In a joint campaign, the FDA, the American Optometric Association and the Entertainment Industries Council are releasing two videos to inform consumers, especially teenagers, about the safety of these contact lenses. “Our intent is that when young people see the lengths professional makeup artists go to, to make sure actors get and use the lenses safely, they’ll take the message to heart,” said Dr. Helene Clayton-Jeter, an optometrist and health programs coordinator at the FDA. In the eye exams, doctors first make sure an actor’s eyes are healthy, for example, that they produce enough tears to allow oxygen to flow to the eye while wearing contact lenses. To make the lenses, makeup artists go through several steps, including creating the lenses’ design, and sterilizing them, as well as fitting them to the actors, because everybody’s eyes are different. For consumers, to use contact lenses safely, the FDA recommends firstgetting an eye exam and a prescription that includes the brand name, lens measurements and an expiration date. After getting the lenses, consumers should carefully follow directions for cleaning, disinfecting and wearing them, the agency says. The FDA also recommends against buying contact lenses from a seller that doesn’t ask for a prescription. Moreover, the agency noted that some decorative lenses, including anime, or circle, lenses are bigger than normal lenses, and have not been approved by FDA. Email Bahar Gholipour or follow her @alterwired. Follow LiveScience@livescience, Facebook & Google+. Originally published on Live Science.